Spring is already in full-force but I just recently did a massive Spring clean-out of my closet. There’s nothing better than finally getting around to cleaning out your closet and organizing. I always find that I am less stressed if I’m living in a area that is clutter free and neatly organized. “Does this fit?”- sometimes it can be a tedious task to take items out and try them all but if you’re going to commit to cleaning you’ve got to do this step. Otherwise, you will find yourself putting it back in the closet and coming back to it the next time you clean. “Have I worn this item in the last 12 months?” – Now, if you’re anything like me and have a lot of clothes, the answer to this question is almost always no. I tend to keep two separate closets, one for winter/fall clothes and one for spring/summer. By doing this I can make sure I get good use out of my seasonal items, some things like tanks you will always find yourself using no matter what the season is, since you can throw a sweater or jacket over top. If I have to really question when I actually wore the article last I toss it! I always have the urge to keep things and think that I will find a use from them one day, but the reality is my closet was overflowing and un-used items were building up fast! “Will I ever wear this again?“- We all have those articles that we just had to have and probably thought it was so cool at the time. Or, perhaps it was a fancy dress you bought for a wedding or a party that you will never wear again. This is a tough one, but think hard about whether your style has changed and if you could really see yourself ever wearing it again or if it was just that one-time item sort of thing. My style is constantly changing and sometimes I question the items I’ve bought in the past. I also don’t tend to stick to any one style in particular, but we all go through our phases. My closet was getting filled with parts of costumes, etc., so instead of keeping these in my closet I started up a costume box for anything I really couldn’t part with and think I could definitely use again. “Is it damaged in any way?“- I currently have a few items that need a quick stitch and you know what, they’ve been sitting in a bag in my closet for a year (what does that tell you??) If I don’t make the effort to get something fixed right away, do I really need to be keeping it, clearly I’m not missing it!! “If I was shopping right now, would I buy this?” – This is a huge one for me. Again, going back to my style constantly evolving this is a tough question for me sometimes. I think, okay, this would be great for the beach, or this would be great for a party. If I can’t find an occasion to wear the item I put it in my pile for donating. 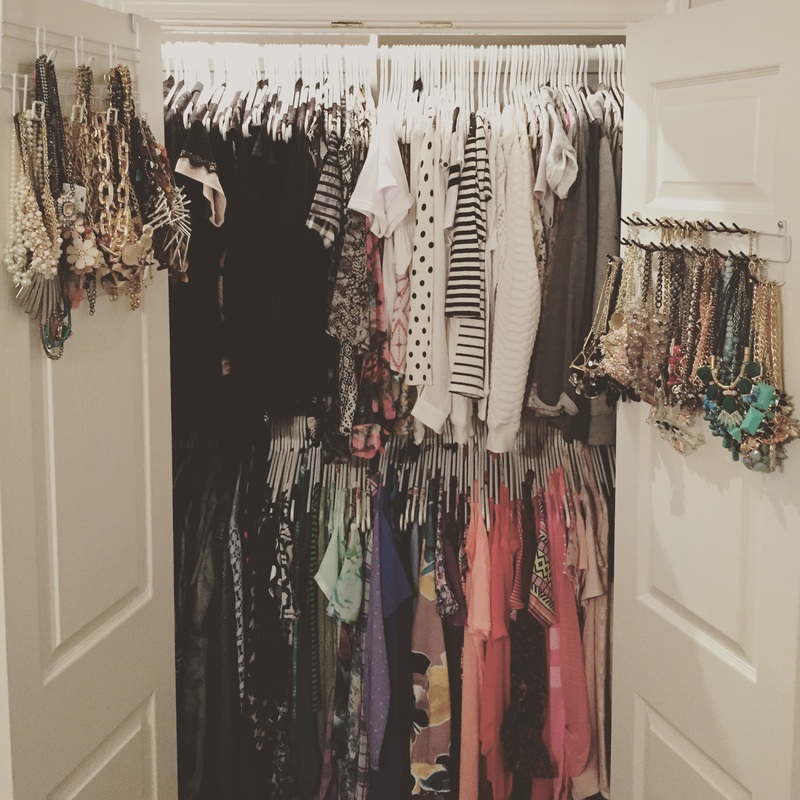 This may seem like a lot of work to go through to organize your closet, but it really does pay off in the end. Keep your pants and dresses separate. I am lucky enough to have a separate closet for these but if you don’t, try using a different part of your closet to hang these in their own area so that they aren’t mixed up with your tops! Double-up on hangers. If I were to put one item per hanger I would be keeping the hanger companies in business even more than I already do. If I have an thin-strappy orange coloured tank, I will hang it on the same hanger as an orange coloured top. It saves you hangers, and space! When I buy a new item, I try to donate at least 2 items. This rule is crucial if you’re a shopoholic like me. If you aren’t getting rid of anything and new items are always arriving in your closet you will find yourself overwhelmed and running out of space quickly! Use all the same hangers. I get just plain white hangers from the Dollarstore, they’re cheap and I like the consistent look of them all being the same. Also, make sure you have them all hanging in the same direction! Hang up racks in your closet if you have any large statement necklaces. For me, this was a huge must-have. I like to be able to see all my jewellery and this was a perfect way to do that and have it look good at the same time! Sufficient lighting. If you don’t have a light built-in to your closet, try having a lamp close by. It really helps to be able to see your clothes in the right light so you know that that black blouse is actually black and not navy blue! Try keeping any shelving and the bottom of your closet clean of junk. We all have a habit of throwing stuff onto the shelves or floors in our closet. For me, I have everything in little boxes or baskets all neatly tucked into my closet. This is the type of stuff for me that I have a hard time getting rid of (receipts, old school assignments, etc.) I find myself going through it quite frequently and purging. I hope you enjoy my tips and that they’re helpful to you if you embark on a spring cleaning journey! I’d love to hear what any of your organization tips are, feel free to comment! For more helpful hints, take a look at link below for an awesome Cosmopolitan article!